Saying that communication is important is an understatement. It serves a central role in our lives, specifically our relationships – from the people closest to us to the most random strangers. Dr. Jeff Fox is this course’s instructor. A Justice Clearinghouse regular, Dr. Fox served an illustrious career in the criminal justice field – working as a town police officer, trooper, sergeant and lieutenant. He holds a Master’s Degree in Criminal Justice Administration, an MBA with specialization in criminal justice and a Ph.D. specializing in homeland security. He shares his experience and knowledge by teaching various courses on leadership, ethics, and criminal justice in various colleges, universities, and in other continuing education venues. The goals, types, and mediums of communication. The basic communication process diagram that emphasizes the cyclical and two-way dynamics of communication. The concepts of grammar, logic, and rhetoric that constitutes true communication. The almost lost art of rhetoric that isn’t taught in schools anymore and it’s five canons incorporating idea development, structure, style, memory, and delivery. An ethical appeal or ‘ethos’ that establishes why someone or an audience must pay attention to what you have to say. ‘Pathos’ which is the appeal to emotions, beliefs, and values to capture the audience’s attention. ‘Kairos’ which focuses on the timing and appropriateness of the delivery. The logical appeal that zeroes in on substantial data or ‘Logos’. Using rhetorical strategies in persuasion. The importance of details in written communication, some rules to take note of for effective written communication, and the traits of effective writing. How good writing skills can help someone think and learn, improve research and communication skills, and teach life lessons on tenacity, hard work, and commitment. The importance of editing, proofreading, revising and asking for peer reviews when it comes to written communications. Effective verbal communication, its types, and the critical role of listening in verbal communication. What comprises non-verbal communication which includes tone, posture, appearance, gestures, facial expressions, among others. 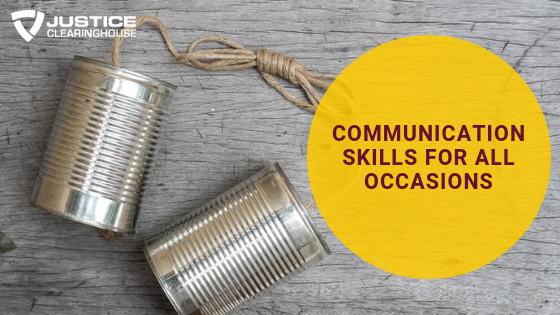 The 5 communication maxims to live by, the 7 C’s of effective communication, and the characteristics of effective communicators. Verbal de-escalation pointers and techniques to reduce conflict and level of agitation. Public speaking and how to be successful at it by understanding the audience, familiarizing with the material, using the voice to project, pacing, and constant practice. Sound bytes when speaking with the media. What is more difficult between listening well and speaking well. Evaluating our listening skills before judging others and dealing with poor communicators. The role of memory when interpreting what is being communicated. Effective logging or journaling techniques.